The end of the 19th century, a culturally immensely prolific epoch in Vienna, formed the breeding ground for the Schrammel quartet. Johann (1850-1893) and Josef Schrammel (1852-1895) grew up in Vienna. They studied at the Conservatory of Music and played various instruments, and in several ensembles. In 1878 they founded the "Nussdorfer Terzett", with Anton Strohmayer (1848-1937) playing the contraguitar. In 1884 Georg Daenzer (1848-1893) joined them on the G-clarinet. In 1891 the G-clarinet was replaced by the Styrian Harmonica, played by Anton Ernst. These instruments (two violins, guitar, and harmonica) have formed the "Classical Viennese Schrammel quartet" even to this day. There were lots of instrumental ensembles and folk singers at the time, but the most famous ensemble of all was soon to be that of the Schrammel brothers. One reason for their success was the brothers’ education at the Conservatory of Music, which was unusual in this trade, the other was the fact that Johann Schrammel was a prolific composer. The folk music of the Schrammel quartet soon developed into a musical style of its own, and its founders became the epitome of this specific genre of Viennese music. The most successful pieces of the quartet which was giving concerts all over Europe were the "Alten Weana Tanz" (old Viennese dances) and the brothers’ compositions: waltzes, polkas, marches, and mazurkas. The quartet reached such a high level of playing, that it was the only folk music ensemble which was allowed to play for the Vienna Philharmonic Orchestra (on the occasion of the 100th Philharmonic concert directed by Hans Richter) and for the Crown Prince Rudolf in Orth/Danube (on the occasion of a deer hunt). The tango was created in Latin America and is closely connected with Buenos Aires and Montevideo. Very old and traditional musical styles and dances of African origin were slowly changed in the wake of European immigration. In 1899 the tango started out as a musical style in its own right, which quickly spread over the USA and Europe. 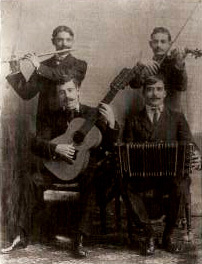 A typical „cuarteto“ at the beginning of the 20th century was made up of guitar, flute, violin and bandoneon. From around 1920 on the musical themes, which up to then had been considered dance music exclusively, were given lyrics. The time between the Forties and 1955 is called the Golden Years of the tango. In the Sixties the tango – the music as well as the dance – lost its mass impact in Argentine, but it had been taken up in many countries already. The tango has actually turned ‚nomadic’. It adopts elements of other cultures without losing its own identity, hence it can return to Argentine, having incorporated foreign accents.